Late last month WPP, the largest advertising group in the world, announced results and forecasts that were sharply down. Those results, though, were not what I found striking about CEO Martin Sorrell’s remarks on the group’s earnings call; after all, I argued last summer that such a decline was inevitable. So what’s our response to all this? Well, further focus on our 4 strategic priorities. Horizontality, which we moved up from, I think it was #4 a year or so ago to #1, is our first critical priority. And it really means ensuring that our people work seamlessly. They’re accustomed to working vertically and by agency brand, but they work seamlessly horizontally across the group together through client teams, I’ll come on to those, and country managers and subregional managers to provide an integrated benefit for clients. And clients are pressurizing us for more effectiveness and more efficiency, this is the way, probably the most significant way that we can respond. Make no mistake, I’m a student of organizational structure and the importance of aligning an organization to the challenge at hand. Moreover, WPP’s conglomerate nature make any sort of cross-agency collaboration challenging; that, though gets at the real problem. If WPP must change the way it works internally, that by definition means the environment in which it is operating is fundamentally different than the one that existed while WPP grew into the organization it is today. It’s a classic example of how being in the middle can be a really great business opportunity, and the utility of ad agencies only increased as more advertising formats like radio and TV became available. Particularly in the case of TV, advertisers not only needed to place ads, but also needed a lot more help in making ads; ad agencies invested in ad-making expertise because they could scale said expertise across multiple clients. 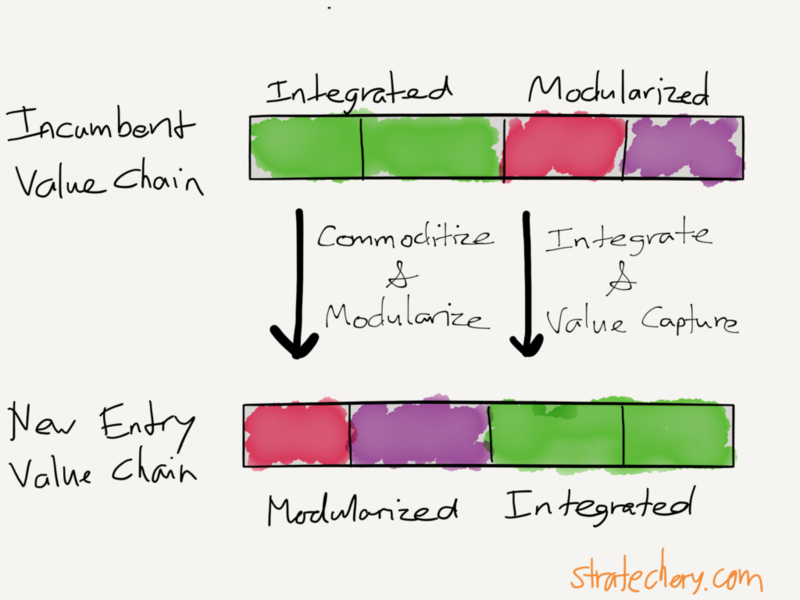 Breaking up a formerly integrated system — commoditizing and modularizing it — destroys incumbent value while simultaneously allowing a new entrant to integrate a different part of the value chain and thus capture new value. This starts to get at what is happening to WPP: the very idea of an ad agency arose from the opportunity to integrate the creation and placement of ads across disparate outlets, creating a one-stop shop for advertisers. 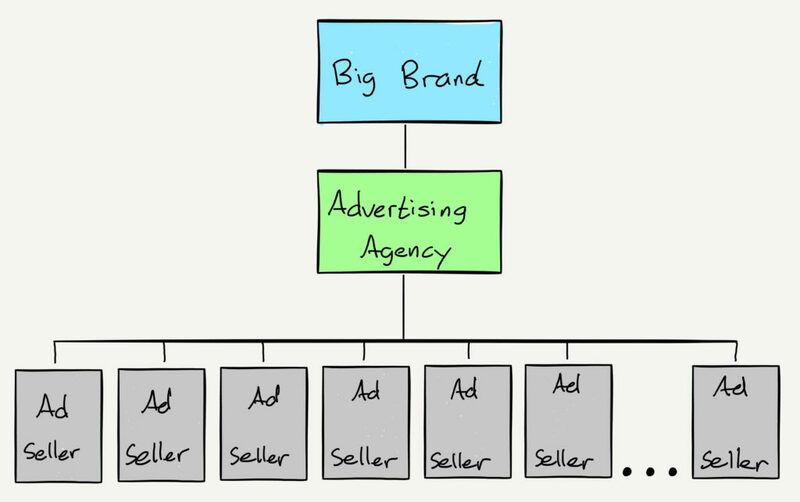 That’s a problem for the ad agencies: when there are only two places an advertiser might want to buy ads, the fees paid to agencies to abstract complexity becomes a lot harder to justify. The problem for Sorrell is two fold: first, fundamentally re-orienting a business away from a vertical integrative approach to a horizontal modular approach is extremely difficult, both in terms of company culture and the effect on the bottom line. 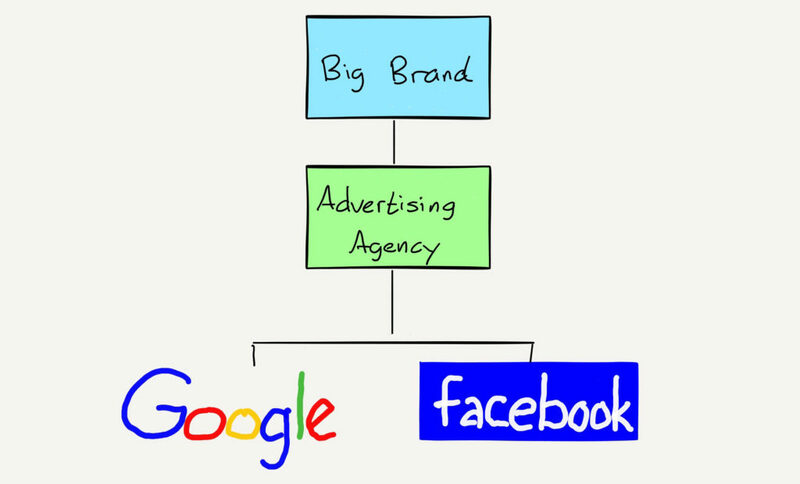 In truth I expect WPP to continue to lose business to digital agencies structured from day one with the assumption that Google and Facebook are the integrators in the advertising value chain. The second point, though, is worse: what is happening to WPP is happening to the rest of WPP’s ecosystem — media on one side, and advertisers on the other. There used to be a limited number of media outlets — newspapers, radio, and television, primarily — all of which had substantial barriers to entry. That meant these outlets had a monopoly on reaching customers, leaving advertisers no choice but to pay up. Now, though, there is an effectively unlimited amount of media: countless web pages, streaming music and podcasts, and services like Netflix and YouTube that, unbounded from the constraints of linearity, offer far more content than was ever accessible before. That, as noted above, meant that discovery mattered most, which meant Google and Facebook. The parallel should be obvious: the clearest manifestation of how the media value chain has been fundamentally reconfigured is the fact that advertising has fled newspapers in particular; in other words, the media story is an advertising story, which is to say that given the upheaval in the media industry, the most surprising part of WPP’s struggles is that it took this long to manifest (thanks, primarily, to television’s resilience). The most obvious change has been the rise of Amazon: instead of limited shelf space, the selection is orders of magnitude greater than any bricks-and-mortar store, and integrated with a scaled fulfillment operation. That new integration means that suppliers and merchants have no choice but to modularize and build their businesses around Amazon. Of course that isn’t the only option: new, smaller companies, like the aforementioned Dollar Shaving Club, can leverage the big platform providers — YouTube, Facebook, AWS, etc. — to compete with massive companies like P&G on far more equal terms than before. For long time Stratechery readers this analysis isn’t that novel; the shift in value chains that result from the Internet enabling zero distribution and zero transactional costs are the foundation of Aggregation Theory. It certainly is gratifying, in a way, to see the theory play out in what has long been the part of the value chain most resistant to upheaval (TV advertising and TV advertisers). There is another context, though: the increasing appreciation outside of technology of just how dominant companies like Google, Facebook, Amazon, and even Netflix have become, and more and more discussion about whether antitrust is the answer. The problem is that much of this discussion is rooted in the old value chain, where power came from controlling distribution. What is critical to understand is that that world is fading away; the fundamental nature of the Internet is abundance, and the critical competency is discovery. Moreover, the platform that harnesses discovery also harnesses a virtuous cycle between users and suppliers that leads to a winner-take-all situation inherent in two-sided networks. In other words, to the extent these platforms are monopolies, said monopoly is much more akin to AT&T than it is to Standard Oil. First, the fact that newspapers, for example, or perhaps one day WPP, are being driven out of business is not a reason for antitrust action; their problem is their business model is obsolete. The world has changed, and invoking regulation to try to change that reality is a terrible idea. Second, the consumer-friendly approach of these platform companies is no accident: when market power comes from owning demand, then the way to gain power is to create a great experience for consumers. The casual way in which many antitrust crusaders ignore the fact that, for example, Amazon is genuinely beloved by consumers — and for good reason! — is frustrating intellectually and eye-rolling politically. Third, the presence of these platforms creates incredible new opportunities for businesses that were never before possible. I already described how Dollar Shaving Club was enabled by platform companies; Amazon has also enabled a multitude of merchants, Facebook an entire ecosystem of apps and personalized startups, and Google every possible service under the sun. In a 30-second commercial, of the sort that WPP might have made, drawing clear villains and easy narratives is valuable; the reality of aggregators is far more complicated. That Google, Facebook, Amazon, and other platforms are as powerful as they are is not due to their having acted illegally but rather to the fundamental nature of the Internet and the way it has reorganized value chains in industry after industry. Moreover, these platforms have far more positive outcomes than distribution-based monopolies ever did: the consumer experience is better, and there are huge new opportunities to build new businesses (especially serving niches completely ignored in a distribution-based world) on top of them. That is a good thing, worth preserving. To that end any antitrust regulation, if it comes, needs a fresh approach rooted in the reality of the Internet. I agree that too much concentrated power has inherent problems; I also believe a structural incentive to provide a great customer experience, along with the potential to create completely new kinds of businesses, is worth preserving. Antitrust crusaders, to whom I am clearly sympathetic, ignore these realities at their political peril.